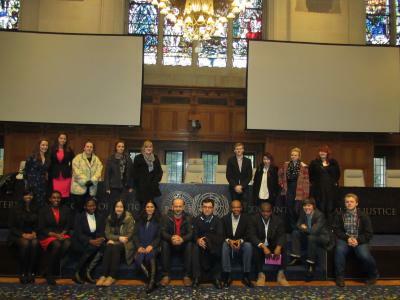 Twenty students from Bangor Law School have visited The Hague in the Netherlands for a first-hand introduction to some of its international courts and tribunals. Led by Dr Yvonne McDermott, lecturer in law, the field trip had a distinct ‘international law’ flavour and united undergraduate, postgraduate and research students. The visit kicked off with a visit to the Grotius Centre on the Leiden University campus. Here, the group attended lectures by Leiden University Assistant Professors Dov Jacobs and Joseph Powderly, who spoke about ‘Recent Developments in International Criminal Law’ and ‘Judicial Law-making in International Criminal Tribunals’, respectively. Niamh Hayes, Head of Office at the Institute of International Criminal Investigations, gave a third lecture entitled ‘The Challenges of Conducting International Criminal Investigations’. On day two, the students joined court officials for a tour of the International Criminal Court, where they were also invited to attend a hearing. From there, they headed to the Peace Palace for lunch and a presentation on the work of the International Court of Justice. The final day of the trip began with a visit to the International Criminal Tribunal for the Former Yugoslavia, where, once again, the group was escorted by court officials and invited to sit in on a hearing. After this, they visited the Ann Frank house before heading back to Britain. The trip was thoroughly enjoyed by the students, all of whom could appreciate its educational value. “Visiting these institutions was extremely interesting, because they brought out the reality of studying international law at a Masters level”, commented Christiana Ijeh, a student on the LLM programme in International Human Rights and International Criminal Law. Aaron Clegg, a second-year undergraduate added that “the trip was a great opportunity for all year groups, whether currently studying international law or not. Being able to visit these international institutions and speak to staff members first hand was naturally enlightening, especially considering all the different views on international law”.